Loss and Rebirth in Chicacabra – LILY & GENEROSO 4EVER! For almost everyone, death is a difficult concept to grasp, especially when encountered at a young age through the death of a loved one. Beyond the trauma of death, grief can also consume and completely destroy people. During the time of grieving a loved one, the purpose of life becomes unclear, and many will begin to doubt their existence and purpose upon the realization that death is completely beyond their control or input. Some will respond to this time of pain, confusion, and perceived loss of control with retreat and isolation while others will lash out in anger and frustration. Grieving is an ugly and exhausting process for everyone; we try to continue our lives when we just want to hide under the covers and cry, forcing us to make mistakes and often feeling the need to further repress the sadness and pain from our loss. In Chicacabra, grief looms over Isabel Sanchez and never seems to dissipate. After brutal carjackers murdered her father, her mother entered a state of catatonia, leaving Isabel to be raised by her uncle Tony alone. With the memories of her mother and father together always in her mind and their sudden removal from her life, Isabel has a difficult time fitting in. The amount of loss she must handle alienates her from her classmates and even her friends, and her guilt for never appreciating her father or mother enough furthers her isolation from others. Isabel thankfully has one family member left in her life, but given the unexpected tragedy of her father’s death and the instant onset of her mother’s vegetative state, Isabel has little to believe that she will have any family members who will continue to be by her side. Consequently, in addition to the immense pain and guilt she carries, Isabel also carries a belief that instantaneously she could lose anyone she cares about, and in trying to prevent the pain she will feel by losing yet another loved one, she shies away from investing emotion and time into most of the relationships around her. Isabel’s grieving is not going well. Paired with her distance from the people in her life, a nihilistic recklessness also lives in Isbel, and one day, she decides to scale down a cliff and wander into a dark tunnel, and here, inside of the cliff, life completely changes for her. After falling into an antiquated science laboratory, a spirit or creature takes over her and disappears, only to return again to dismember two men who attempt to assault Isabel in an elevator. Isabel seems to have a new protector, but this guardian does not arrive from the sky to save the day; it lives inside of her and takes over when Isabel faces danger. At first, Isabel does not know the identity and the history of the guardian creature living inside of her, and she struggles to learn how to tame its release. However, after the night of the elevator attack, Professor Chemo, a scientist who has searched for the presence of chupacabras in Puerto Rico his entire life, fortuitously finds Isabel’s driver’s license at the elevator scene and rushes to Isabel in order to help to explain what to expect from her new friend. Upon the arrival of Professor Chemo at the Sanchez home, Isabel and her uncle learn of her hero’s identity: her defender is a chupacabra queen who has merged her soul with Isabel’s. With Chicacabra (the name Isabel gives to her chupacabra), Isabel is always safe; however, the people in Isabel’s are not at first. Like Isabel, Chicacabra has experienced an immense of loss herself through the hands of human beings, so much so that she is the last of her kind. Both Isabel and Chicacabra need to learn how to trust people again, and the scenarios in which the two place other facilitate their healing process from their individual losses. The presence of the Chicacabra in Isabel’s life and her uncle’s kind response and immense amount of understanding of his niece’s unique existence as part human part animal opens Isabel’s eyes to see how much her uncle loves her and cares for her, allowing her to be more loving and grateful to him. Additionally, Professor Chemo’s commitment to helping Isabel understand Chicacabra expands Isabel’s understanding of family and her willingness to accept a new person in her life. In parallel to Isabel’s growth, Chicacabra also learns and grows. The kindness Isabel’s uncle and Professor Chemo show to Chicacabra allows her to understand that not all humans intend to harm her, and consequently, Chica does not always need to remain in a hostile defensive or attacking state. And, like Isabel, Chica now has a family she appreciates and loves. Isabel and Chica have plenty of adventures in their attempts to adapt to each other in Chicacabra. Both have to learn each other’s completely foreign tendencies and tempers, and both have to try to re-integrate into a world they believed had left them behind. Despite the species differences, both have an immense amount of pain, grief, and sorrow to overcome, but together, they can begin to live again and learn to heal and help not only themselves but also the people around them, ranging from Isabel’s uncle to Tarantino, a vejigante who shepherds children’s souls in the transition phase between earth and the afterlife. Chica and Isabel have awakened from their slumbers of grief to see a new world to explore and experience. Filled with an understanding of the ability of grief to cripple, Chicacabra uses the chupacabra as a metaphor for the grieving process. It is fundamentally inevitable to live without losing a loved one, and we all must find a way to continue to live on, but that task is not an easy or simple one. For Isabel, Chicacabra enters her life, and yes, she has supernatural powers, but most importantly, Isabel finally has more awareness for the people and the world around her and a better capacity to understand others’ suffering as well, pulling her out of the isolation that simultaneously magnified and suppressed her pain and worsened her grieving. Though it is unlikely a chupacabra will ever combine its soul with ours, Chicacabra explores how we can understand and learn from grief rather than allowing it to eat us away. Never trite or overly simple in its approach, Chicacabra successfully describes the complexities and nuances surrounding life after the loss of a loved one with grace, humor, and energy in addition to a complete understanding of sorrow. It’s a perfect read for children and adults alike and one I certainly wished I had read when I first experienced the death of a loved one when I was a teenager myself. 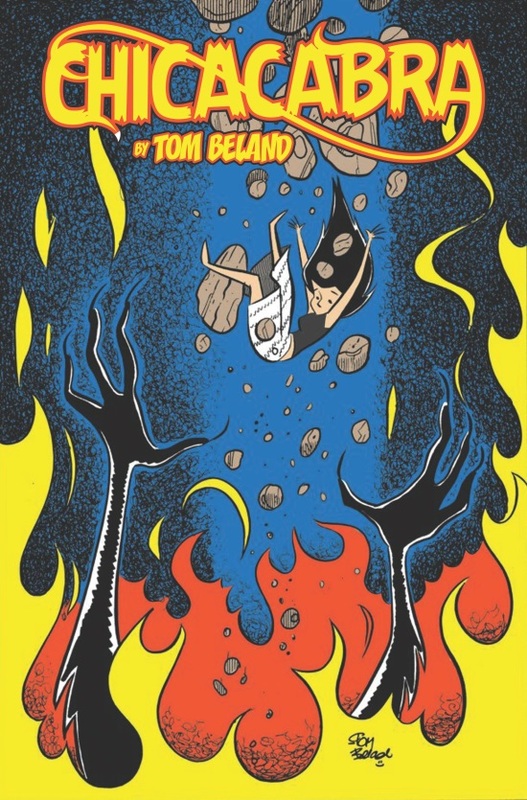 Chicacabra by Tom Beland is available via IDW now. Generoso Rolls A Mean Braciola!